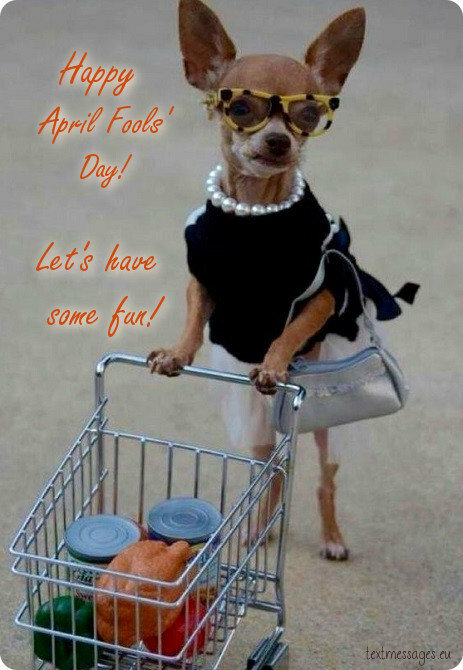 April 1, known as April fool’s day is a day filled with lots of surprises and, sometimes unpredicted activities by people of different age group and genders. April fool’s day is accompanied with a right set of circumstances where people can benefit each other by sharing laughter and an unforgettable experience. It is celebrated with naughty activities, playing some pranks, in a funny way, messaging and fooling people with show of smart skills. Here are some April fools messages for friends with images for your naughty inspiration. Hey bruh! You are simply one of the cutest persons in this world!! Just a second, don’t misquote me. CUTE means: Creating- Useless- Troubles- Everywhere. I might make a joke at you, but I think you’ll have enough of them this day. That’s why I just wish you a good day full of fun and laugh! Sometimes we don’t need any special reason to smile. We smile just because we feel fine. So may your life be filled with laugh and joy all year round! Today the doctor told me I was ill and there was nothing that could help me. I’m dying… Dying laughing! Ha-ha! Happy April Fool’s day! April Fool’s day is an incredible holiday, because actually nothing special happened this day, but, never the less, we all are cheerful and happy. Well, that’s right, because happiness doesn’t need any reasons. So, it’s finally that day again huh? When everyone is afraid to believe anything, because everything they say seems a lie, everyone is pranking one another, just waiting for the right moment to get them… good luck to all of you fools! Some people can’t distinguish a harmful joke from a cruel prank. I hope you’re not this kind of person and all your jokes are really funny! 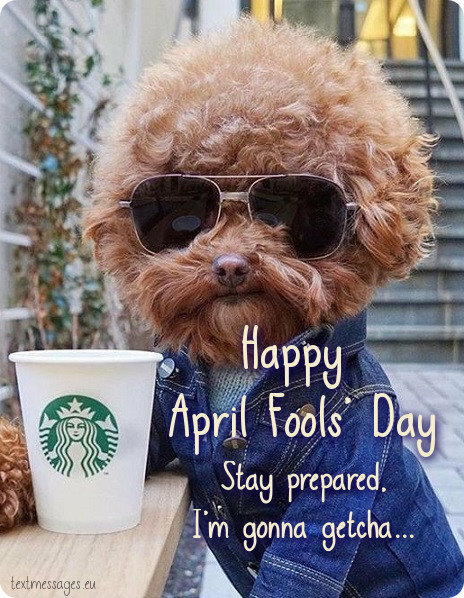 Today is April Fool’s day, but I hope you won’t get fooled. Instead, try to make your nearest and dearest laugh from harmless and funny pranks. There are a lot of languages on our planet, but laugh is the language that doesn’t need any translation and can be understood by everyone. Happy April Fool’s day! If laugh makes our life longer, then April Fool’s day is a great opportunity to provide us with a happy and long day full of positive emotions. Feel free to joke and don’t get offended if someone plays tricks on you. 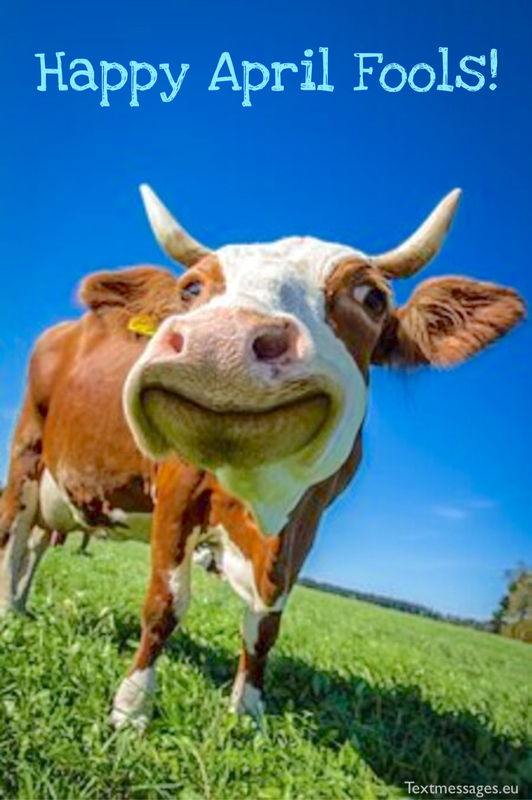 Wish you a good mood! There would always be one heart that will beat for you today and always. Guess whose heart??? It’s yours, Stupid!!! I believe that April Fool’s day should become an official holiday. Because this is the holiday in honour of laugh and happiness – the most magnificent emotion a man can experience. Enjoy this day and don’t play sick jokes! Every day we wake up in the morning, go to work and it seems that nothing will change. It’s such a routine. But there’s one day, when we can return to our childhood and forget about dull adult life for a while. 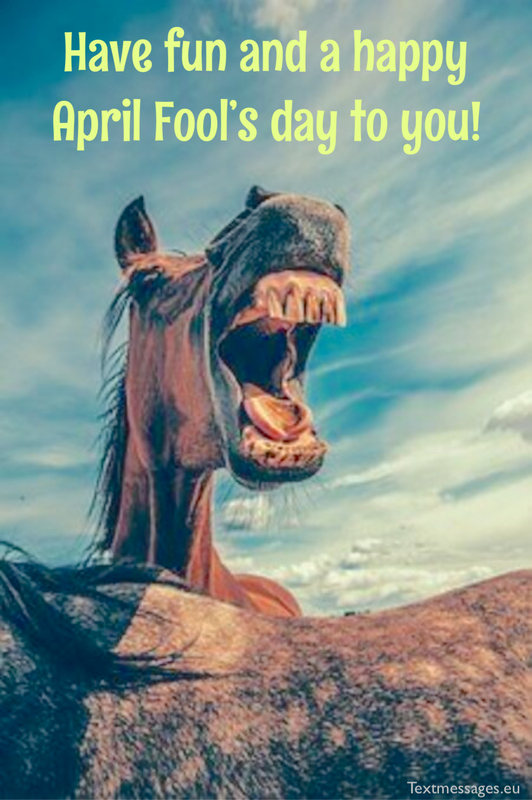 Have fun and a happy April Fool’s day to you! April Fool’s day is famous for its pranks and sick jokes. But I want you to remember this day for the joy and laugh it will bring you. Happy April Fool’s day! If you’re tired – just laugh, because 5 minutes of laugh are considered as an hour of rest. If you’re sad – just laugh and your sadness will go away. Laugh is a panacea for everything. Happy April Fool’s day! 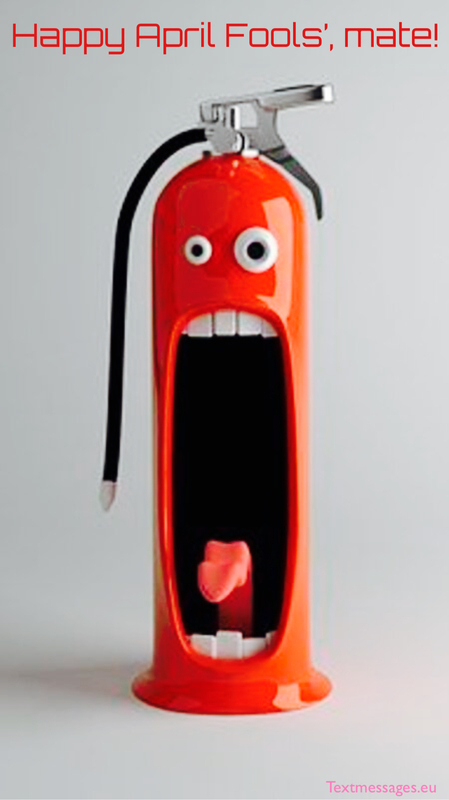 Ahhh… April fools – a day of breakups, broken hearts, bones and just plain stupid, stupid ideas… because only a person who is the pro at April fool’s day gets a laugh, because every single one of you are his victims.. Good luck! For me, April Fool’s day is not the day of making fools out of my friends and family. On the contrary, this day gives a wonderful opportunity to cheer them up and make a little bit happier. Some people say that April Fool’s day is the funniest day of the year. Others say that it is the day of sick and cruel jokes. I don’t know what your point of view is, but I wish you a lot of hearty laugh and true happiness. I hope this day will become a day to remember. Not because you’ll get fooled, but because it will bring you many positive emotions. Happy April Fool’s day! We’re so busy and serious that there’s no place for childish laugh in our life. But sometimes it’s really necessary to relax for a while and take this life with humour. It’ll give your life a fresh coat of paint. Happy April Fool’s day! If today anyone praise you for your great look and amazing style, kick them off and ask, how dare they fool you before April 1st. This is the first day of April and you should spend this day as good as it’s possible. If you’re in a cheerful and happy mood, then this mood will follow you during the whole month. Happy April Fool’s day! Why everyone is so serious? I’m tired to see joyless faces. Cheer up and smile, because today there are no reasons for you to be so serious and stressed! Attention, danger! Laughing gas is everywhere and you should beware. If you breathe it into your lungs, you won’t stop laughing till the end of the day. Happy April Fool’s day! Today you should be very careful. 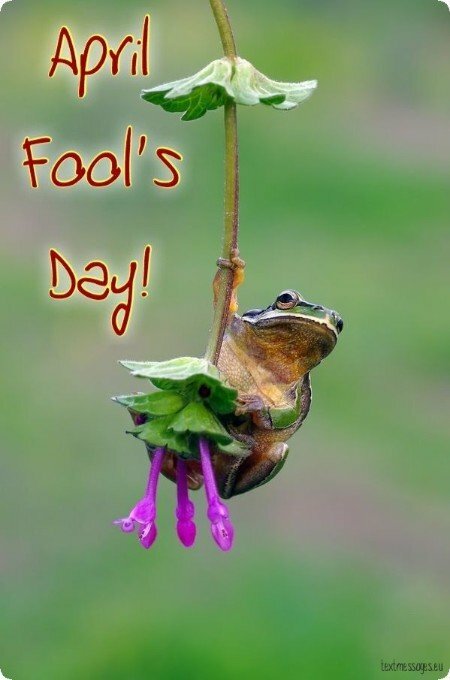 Today everything depends on you, so you should decide whether you will be get fooled or you’ll make fools out of them! Today I wish you to have funny jokes and make everyone around you smile and laugh. You’re really good at it. Happy April Fool’s day! I hate this day! I’ve been a victim of sick jokes several times already! They doused me with a bucket of cold water, ripped my pants and broke my leg! But despite my helpless condition, I’m still able to joke. Ha-ha, happy April Fool’s day, dude! I like April Fool’s Day, because it makes me smile and laugh. The only reason why I hate this day is that your jokes are always better than mine. How do you do it, man? Ha-ha, just kidding… There are no jokes better than mine. I’m sure nobody will escape your amazing sense of humour today. Make them all laugh so hard that they would remember this day for the rest of the year! Happy April Fool’s day! It’s impossible to stay boring and frowning when spring is all over the place! I wish you to spend this wonderful sunny day laughing together with your friends and family and just enjoying the atmosphere! Someone misses you. Someone needs you. Someone Worries About you. Someone is Lonely without you. Guess Who? It’s THE MONKEY IN THE ZOO 😉 Happy April fools’ day! You should know that you’ll face a lot of evil jokes and lies this day, that’s why I want to be the only honest person in your surroundings and tell you the truth. You’re the most horrible man I’ve ever met and I hope I’ll never see you again. Ha-ha, I’m just kidding! Happy April Fool’s day! April Fool’s day is a great reason to be less serious and become carefree children to some extent. Wish you a lot of funny and harmful pranks today! Today is April Fool’s day, but no one should feel like a fool. This is the day for laugh, joy and funny, but not sick, jokes… By the way, do you remember where we buried the corpse when we got drunk at that party last week? April Fool’s day is the day when you can play tricks on everyone as much as you want, unless someone of them will play a trick on you. Be on a guard and don’t let them take away your crown of the King of jokes! Everyone loves good jokes and great sense of humour. And today is the day when we can show our talent and make our nearest and dearest laugh brightly. Happy April Fool’s day! By the way, studies showed that all fools use their THUMB when they read SMS. Now it’s too late, don’t bother to change your finger! Another fool detected! I may forget to wish you on birthday, Christmas or even New Year day. But I am very thankful to God that I never forget to wish you on this special day dedicated for people like you. Happy April fool! As is known, laughter makes us live longer. So stop being so serious and relax at least for a day! Enjoy playing jokes and laughing! You can laugh all day long and nobody will say you’re crazy. You can make fun of your friends and family, but nobody will be offended. That’s the beauty of this day. 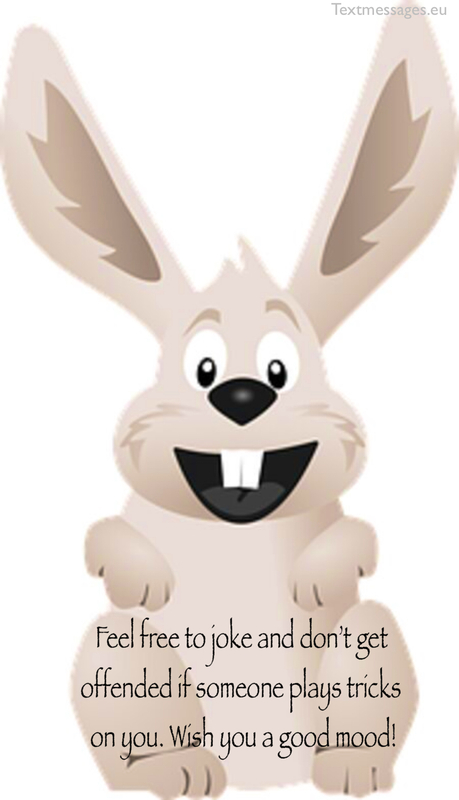 Wish you a great mood and many-many funny jokes! Hey, ever thought of the best day to propose a girl. It’s simply April 1- U Know Why?? If she accepts you are lucky, and if it’s the other way round -just tell her April Foooool!!! We have known each other for so long, don’t you think we can be more than just being friends? Cos I really do love you, I need you to stay beside me. Will you be my partner for a bank robbery? Happy April fool day! April first is just like any other spring morning, you wake up, do what you gotta do, but then you remember… it’s April fool’s day, and on that day there are two types of people, some fool others for laughs, prank them and just have fun, others lock their doors, windows, turn of their phones and just wait for the day to end. The day for the pro prankers is finally here, you know, it’s like a second birthday for them, they get to do what they love and they can’t be judged for that, this is why I love April fool’s day! And of course don’t forget the fools! You think you are the best at pranks huh? You thing you can fool people that easily without them getting back at you? Well, I have to say… You are absolutely right, because people these days are cowards, keep up the good work! 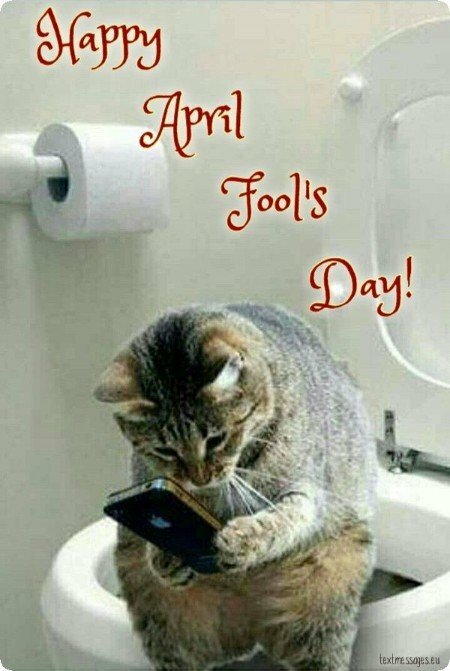 April fool’s day is a horror day for people who don’t know how to prank, or fool anyone, because when they try, it backfires, and they end up being the fools, pro tip: go to google and just read something useful about April fools, trust me it helps! It’s that time of the month again… April fool’s day! When people end up in the hospital with heart attacks hearing the words “I’m pregnant, and it’s yours” or “it’s over!” and it is actually being over, when the other person thinks it’s a joke.. ahhh best day ever! 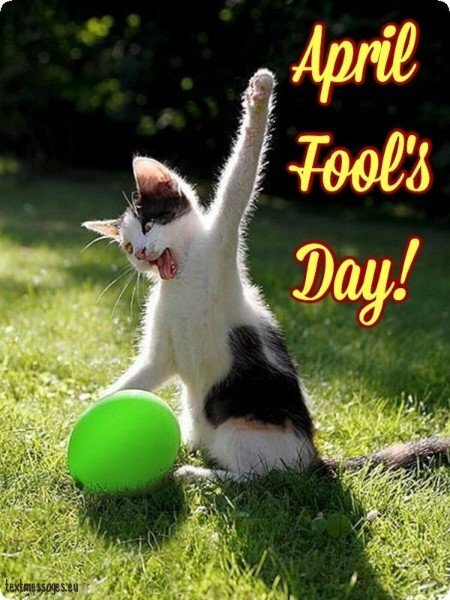 April fools – the day when no one trusts anyone, because you never know what could happen, maybe you will end up with a water balloon, or pie to your face, or just plain pranked, because people these days are pros at this stuff! Some people know April as a beautiful spring month, some call it the middle of spring, but only a few remember one special day… April first! In other words April fool’s day! I hope you don’t get fooled!